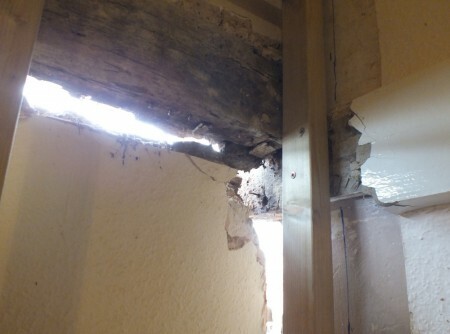 On the other side of the rotten timber frame is the main bedroom. It’s a bit dingy in there as the window has been boarded up for the last few weeks. 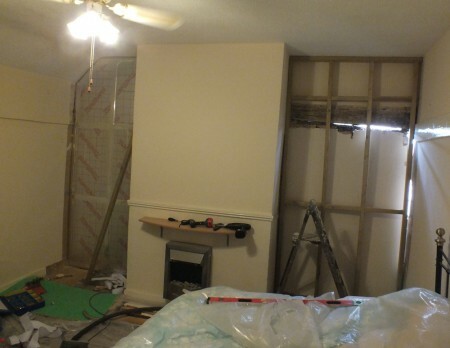 To avoid too much more inconvenience I’m building new stud walls on the inside before removing the outside wall. There will be a 25mm ventilated gap between the stud wall and timber frame on the outside wall which will help keep the timber frame dry. 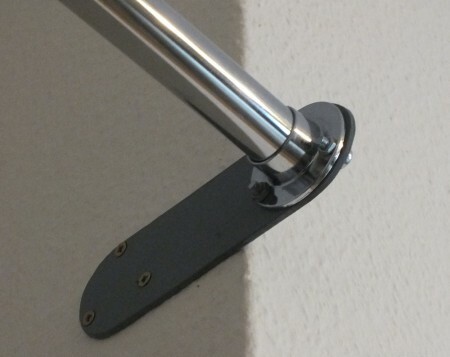 The studwork is 3 by 2 with 75mm Celotex infill. Exposed beams in the bedroom were plastered fairly recently, presumably mostly in the 1970s when old looking things weren’t fashionable. The beam on the outside wall was plastered much earlier in lime, and it was this plaster that was holding the wattle and daub infill in place. 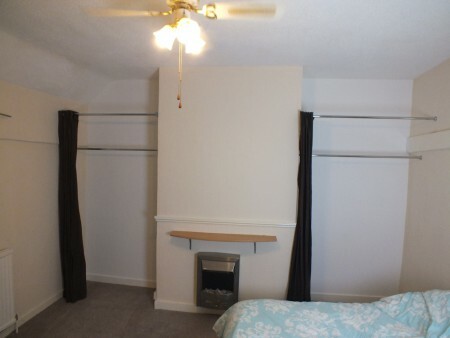 I don’t like plasterboard but it seemed cheap and convenient and would be at the back of the wardrobe so hardly mattered. But It’s messy to cut, fiddly to match to oddly shaped walls, there is huge wastage, and the filler sinks and needs doing twice. 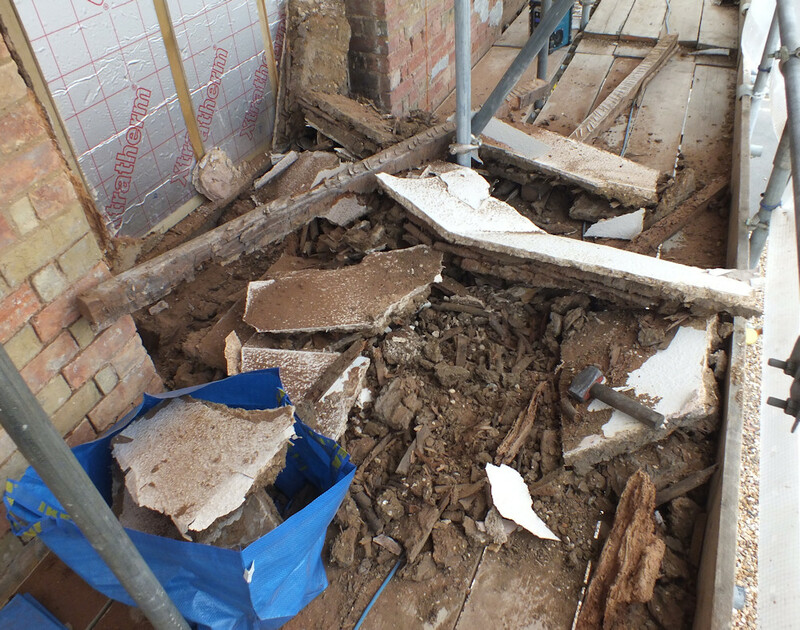 Next time I’m going to splash out on lath and plaster. 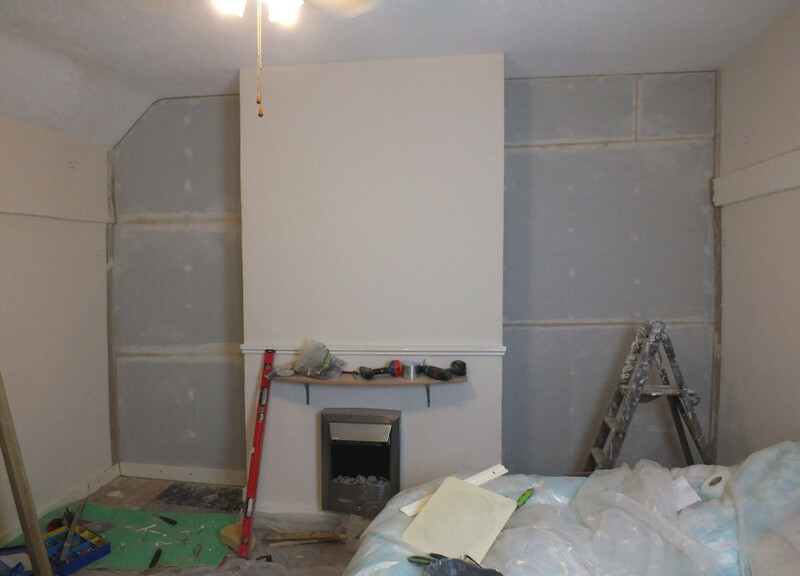 Installing the stud wall lost 4 to 5 inches of space from the alcoves. The pole supporting the curtain that hides the wardrobe now has an industrial looking extension to bring it forward of the chimney. Finally, 6 days into a 3 day job, it’s all finished. The plastic sheet covering the room was very effective at containing the mess. The room will be decorated properly at some point when we get around to decorating, but I need to remember to rebuild the outside half of the wall first. Well that was all very boring. It’s the other side of the wall where the action is going to happen. This entry was posted in Building, Insulation on July 16, 2015 by malcolm.